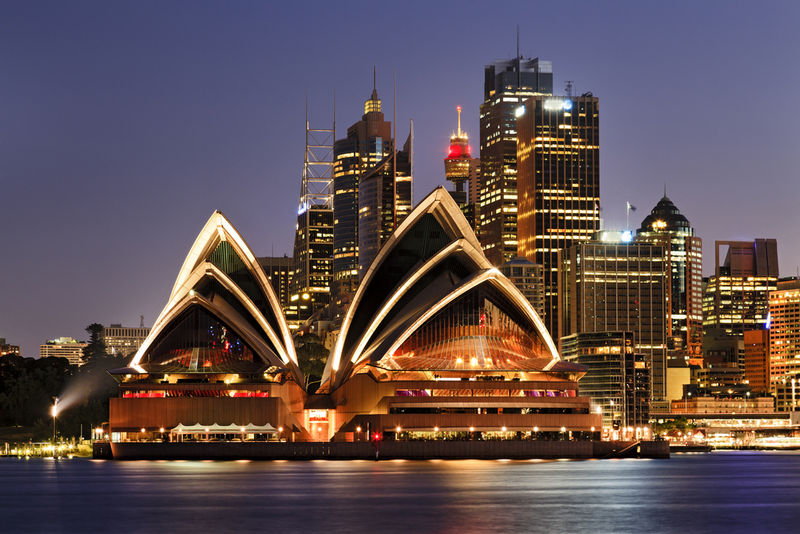 A large island continent, Australia is full of cultural and natural treasures. Although in terms of size, the country may rival continental USA, it also has one of the lowest population densities in the world, with the majority of people living within 20km of a coastline. Known world over as one of the ultimate travel destinations, Australia’s beauty and promise of adventure lures millions of visitors to the islands each year. One of the most iconic sights of Australia is of the outback, the vast desert that sprawls throughout the interior of the country. One of the most popular attractions in the Alice Springs area of the Australian outback, which is also one of the most easily accessible, is Uluru, a huge sandstone monolith, sacred to indigenous Australians, and believed to be over 700 million years old. Nearby is Kata Tjuta, a group of spectacular red rocks and domes that rise out of the desert, and, slightly more further away is the Alice Springs Desert Park, a top Australian attraction. Since the outback takes over most of Australia’s interior, Australia was forced to become more of a coastal country. Its cities are cosmopolitan but in a laid-back way, with the beach and ocean playing a huge part in daily life. Sydney’s stunning harbour, surf beaches and twinkling skyline make it a popular destination for many tourists, while Melbourne offers up Victorian architecture, plenty of festivals, and a strong food culture. Perth, in a way, contrasts these two cities. Although it is the largest city in Western Australia, it is relatively slow-paced, but its towns are rich in character and the nearby wine regions make it worth the trip. No matter which city you visit, you will never be short of bars, pubs, shops, and restaurants to choose from, as well as museums and other cultural attractions. For most visitors that are headed to the East coast of the country, the Great Barrier Reef is their number one priority, which is no surprise since the reef is considered to be one of the seven natural wonders of the world. However, although this may be the most popular, the country is full of other spectacular natural wonders, from the Katherine Gorge in the Nitmiluk National Park to Kangaroo Island with its diverse native wildlife, to the longest parallel sand dunes in the world in the Simpson Desert. With so much natural diversity, it is no surprise that there are plenty of options for outdoor activities throughout Australia, be it hiking through the rugged mountains, known as bushwalking to the locals, to diving down into the Coral Sea’s Predator Playground and watching the sharks feed, to surfing at one of the many popular surf beaches. You can also go skiing in the Victorian Alps, white water rafting in the Tully River, or four wheel driving on deserted beaches or in the outback. From adrenaline-fuelled travel adventures to cultural city breaks to relaxing beach vacations, Australia really can offer it all. The biggest, most densely populated and most cosmopolitan of all Australian cities, Sydney is the capital of New South Wales and lies on the country’ east coast. With immigrants now settling here from all over the world, Sydney has a vibrant buzz and an international energy that it was previously lacking. The Opera House, with its unique sail-like design, is one of the most iconic buildings in Sydney, and is located on the popular tourist trail that also includes the Harbour Bridge, which you can walk to the top of for a thrilling view of the city, and Bondi Beach, with its spectacular coastal walking trail. Sydney Tower is the tallest building in the city, and with an observation deck at 820 feet, offers panoramic views as far as Terrigal Beach to the north. Although it may not be the outback, Sydney provides visitors with the opportunity to experience native wildlife with the Taronga Zoo, which offers visitors the chance to sleep over and wake up amongst the magnificent creatures, as well as the Sydney Zoo in Darling Harbour. In addition to its spectacular sights, there are plenty of other activities to keep you busy in Sydney, from performing aerobatics 4000 feet in the air above the city, to skydiving over North Wollongong Beach to diving in the Sydney Harbour to surfing at Bondi Beach. Those of you looking for calmer activities can take advantage of the wide range of shopping malls, boutiques and markets that Sydney offers. There are also plenty of restaurants, serving a wide range of international cuisines, and those of you who want to stay out later and dance the night away will definitely not be disappointed by the choices available throughout the city. One of the most exciting and beautiful city destinations in the world, Sydney seems to have it all, and you will no doubt soon want to return for a second visit. Trying to contact Orogold store Perth. Not answering phones. Are they still open? The Perth location has recently closed. For further assistance, please contact our store in Sydney. Can someone please advise the opening hours of the Sydney store? I am based in Brisbane and used to purchase products through your Perth store. The OROGOLD Store in Sydney is open from 10.00 AM to 08.00 PM (Monday to Saturday) and from 11.00 AM to 07.00 PM on Sundays.